The GAZ-MM (72-K) (72-K gun mount on a GAZ-MM truck), or as the 72-K GAZ-MM, is a Rank II Soviet self-propelled anti-aircraft vehicle with a battle rating of 2.3 (AB/RB/SB). It was introduced during the Closed Beta Test for Ground Forces before Update 1.41. The 72-K is an auto cannon, bringing a better gun to the playing field. Granted, it is still mounted on an unarmored truck chassis, and the gun shield will only protect from light machine-gun rounds. The main purpose of this vehicle is to destroy enemy aircraft, mostly it is used to defend friendly tanks from air attack. However, if used correctly, it can damage or even destroy tanks. The fact that the gun has to elevate to fire forward means that one should never face an enemy head-on in this truck. Whilst a player can still shoot aircraft while aiming the turret forwards, against low-flying attackers the task will be more complicated. Whenever possible, one side of this vehicle should have cover - if no targets are to the right of the truck, for instance, it would be senseless to leave the right flank exposed for nothing. Wheels are 2 mm thick while the chassis is 5 mm thick. (Armour Piercing tracer) shell As an armour-piercing round, it is too small to be a significant threat against ground targets but the lightest armoured ones, and has little effect on planes unless you get a good shot on a critical area. Not really a recommended belt to use, but in an emergency it may save your life. Ammo racks of the 72-K. When it comes to fighting tanks, one should always have a hit-and-run mentality in the 72-K GAZ-MM, since, once discovered, this vehicle is an incredibly easy target. The exception is self-propelled guns with an open top, like the Marder III, the Kugelblitz or the Hellcat. These are very vulnerable to any quick-firing weapon, and as such can be taken down easily if surprised by a volley of 25 mm shells. However, many of these have either fast-firing main guns (in the case of AA vehicles) or machine guns that can devastate the unarmoured 72-K GAZ-MM in seconds. 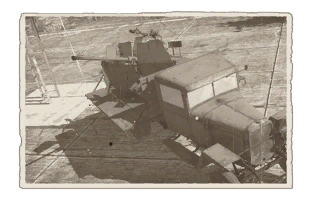 If you are new to the game or very serious about it you should station this vehicle in a safe area away from the main battle area but close enough to defend your comrades. 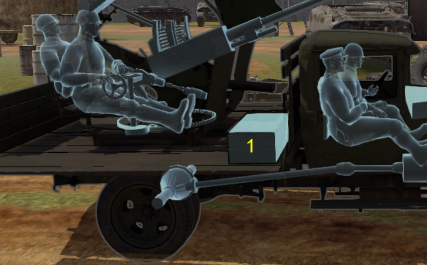 This vehicle's gun can not aim effectively in the front (as the front of vehicle stops it.) so you might want to point the back or side to the enemy. Also you have to consider that the tracers you fire can be easily tracked by enemy tanks so it is wise to change position once in a while. Enemy aircraft will most likely be visible from your spawn. If shot at most players will retreat and call an artillery strike. Decent turret rotation and elevation. Good acceleration, that allows it to flank slower tanks/vehicles when encountered at close-quarters. AP rounds with enough penetration to kill light and medium tanks that it may encounter. Highly vulnerable to any HE rounds. Cannot shoot straight ahead due to the driver's compartment. Highly vulnerable to artillery fire. Vulnerable to machine gun fire, aircraft strafing, and collision damage. Poor vehicle stability, very easy to flip upside down when driving in rough terrain. The 25 mm automatic air defence gun M1940 (72-K) (Russian: 25-мм автоматическая зенитная пушка образца 1940 года (72-К)), developed in 1939-1940, was a very common anti-aircraft weapon in the Soviet Union, leading to about 4,860 units produced. It occupies an intermediate position between large-calibre anti-aircraft machine guns of the ANC and the more powerful 37mm anti-aircraft guns of the 61-K, this vehicle was designed for an Infantry Regiment level air defence. The gun was created in the beginning of 1940 at 8th Kalinin Artillery Plant under the guidance of its Chief Designer Mikhail Loginov. To increase mobility in the second half of 1941, the 72-K anti-aircraft machine was installed on the chassis of the GAZ-MM. GAZ–MM is a truck with a maximum usable weight of 1.5 ton. It was produced at the end of the 1930s and at the first part of the 1940s by GAZ in the Soviet Union. It is a simplified version of Ford Model AA’s Soviet licence version. At the beginning of World War II more than 150,000 were in use by the Red Army. 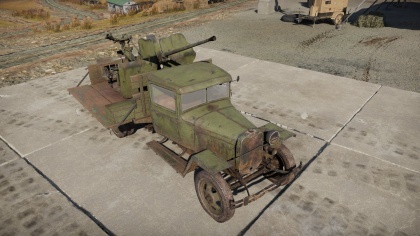 Tests showed the success of the design and the gun mount so it was put into serial production, called the GAZ MM (72-K). However, only 200 units were produced, as the manufacturer’s factory, Kolomna Locomotive Works, was evacuated. Subsequently, the GAZ MM (72-K) was no longer produced. This page was last edited on 17 January 2019, at 07:13.